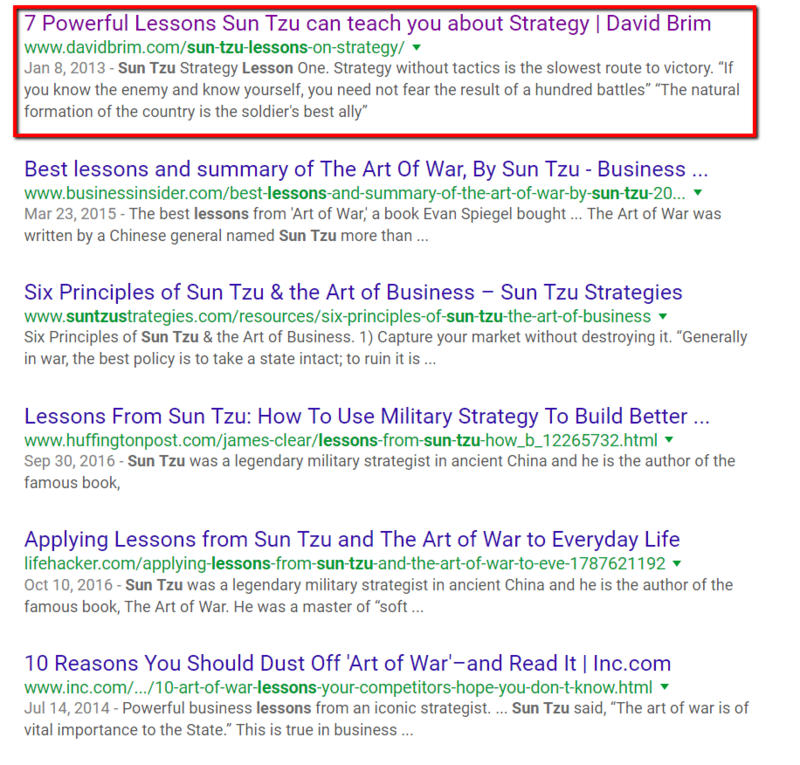 Over three years ago I decided to write a blog post sharing 7 Powerful Lessons Sun Tzu can teach you about Strategy. In that post I researched insights from ancient Chinese philosopher and military strategist Sun Tzu and shared how these lessons can help business professionals win the battle for customers in their respective marketplace. In 2016, this single post generated over 20,000 unique visitors to my blog. A post that I wrote three years ago generated over 20,000 unique visitors this year to my blog without me paying a dime for the traffic (and the year isn’t over yet). Creating quality content is an essential part of any effective SEO (Search Engine Optimization) and Social Media strategy. This is also one of the most neglected aspects of Social Media and SEO. Many business owners and marketing professionals want their “website optimized” to rank high in search engines. They get excited about setting up their social media profiles and eagerly track their likes, followers, and connections. While having a quality website, the right social media profiles, and quality connections is valuable – it is content that truly brings it all together and delivers the results they are seeking from their social media and SEO efforts. It is important to remember that Commodity content gets commodity results. Below are 6 BIG BENEFITS of creating Awesome Content. I am not going to tell you that Print, TV advertising, and direct mail are dead. They are not. Every marketing and/or advertising tactic has its place and time to shine. My marketing agency has gotten amazing results from newspaper advertising for certain clients over the last year. What I will say is that print advertising and direct mail have a very short shelf life. It may cost tens of thousands of dollars to place a print advertisement for one day. After a couple days, that paper is generally thrown away along with your ad. Creating high quality digital content does take time and resources up front, but it can continue to drive traffic to your website for many years to come. As an example, here is a snapshot from my Google Analytics for the Sun Tzu post I referenced that I wrote three years ago. You’ll see that this post has generated over 20,000 unique page views and visitors this year. Ever heard of David & Goliath? Sure you have. 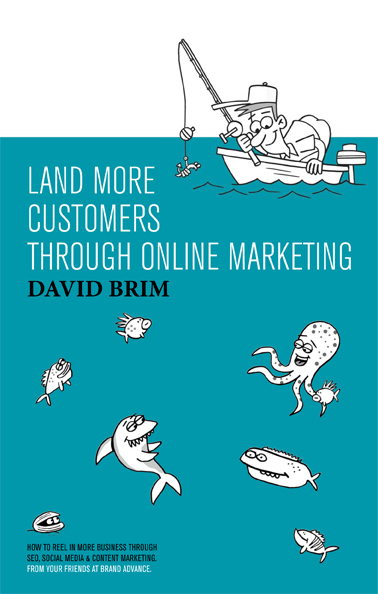 Quality content is like your sling shot to battle the giants. Google has changed their search algorithms and placed a much larger value on quality content. As an example, you’ll see that for the search term “Sun Tzu Lessons”, my blog is able to out rank some giants including Business Insider, Huffington Post, Life Hacker, and INC magazine. Creating high quality content, and adding well positioned social share buttons increases the liklihood of visitors sharing your content with others. Google and other search engines do look at page level metrics such as social share signals and links pointing to the page when determining their rankings. This is a self perpetuating feedback loop that continues to make itself stronger and stronger. The more the content is shared, the more people see and share the content. Sharing valuable content gives you the opportunity to educate and help others. If they find your content to be beneficial they may subscribe to your blog, or reach out to you to get more customized assistance, which can lead to new business. When a visitor comes across valuable content that you created they may have a desire to be aware of future insights or content you create. This could lead to them following you on social media, subscribing to your blog, or simply frequenting your blog to read new posts. As your audience and influence grows you build even more “reach” and opportunities to distribute your content, engage others, obtain more press attention, monetize your content, and form new meaningful relationships. As the amount of quality traffic to your website increases you have more opportunities to “convert” this traffic into a subscriber, lead or paying customer. Depending on the type of business you are in this conversion could be: a phone call, newsletter subscription, purchase of a product, request for a quote, etc. I do suggest that you add a call-to-action box under your blog post. I utilize a WordPress plugin called Socialize to accomplish this. You’ll see my call-to-action box below this blog post and it includes multiple conversion opportunities such as subscribing to my blog, purchasing my book, and sharing my post. I hope that you have found this blog post to be helpful! I recently had the pleasure of being a guest on Blog Talk TV, a television show airing to 1.5 million households weekly in Virginia and Florida. I sat down with the hosts of the show Bess Auer and Ben Reed to discuss business blogging, my blogging journey and book Land More Customers through Online Marketing. 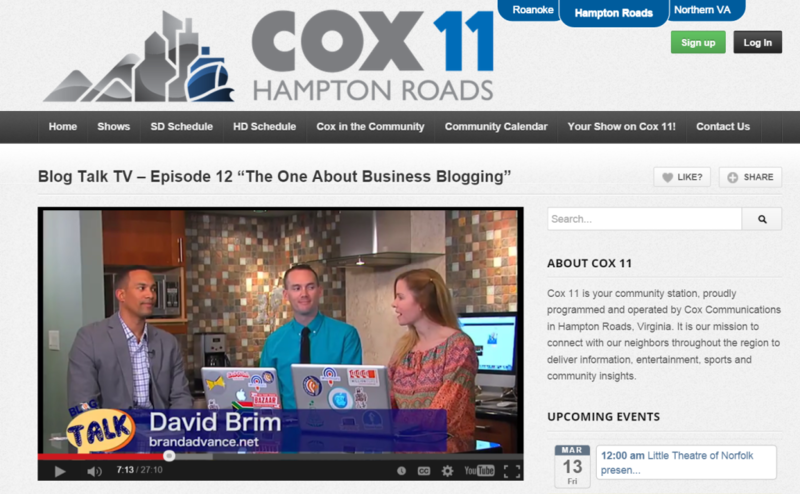 You can learn more about the show by visiting BLOG TALK TV Online. I’ve also added the full show below in case you wanted to check it out. If you’ve spent any time around my blog you know that I am a big fan of basketball. I was enthralled with it in my younger days and even played a year in college. March Madness is a very exciting time for many basketball fans like myself across the country. It’s the time of the year where 64 of the nation’s top teams duke it out on the hardwood for the rights to be called NCAA National Champions. It’s an emotional and exciting ride for players and fans alike as illustrated in the popular “One Shining Moment Videos” that release after the championship game each year. With no surprise there are marketers willing and ready to take advantage of this exciting time of the year for sports fans. Enter Quicken Loans and Yahoo. 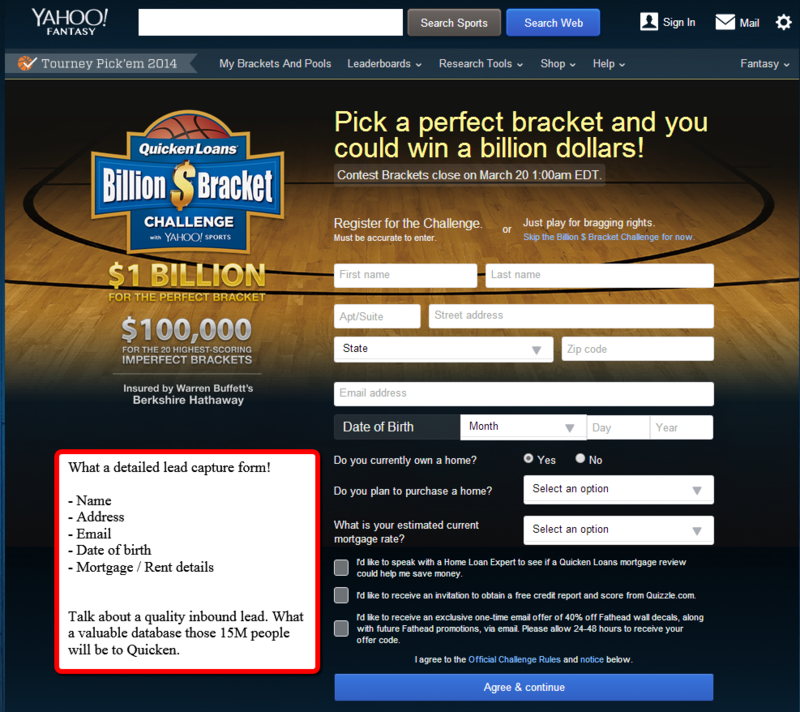 Quicken Loans has partnered with Yahoo to give away one billion dollars! The $1B with insurance by Warren Buffet’s company Berkshire Hathaway. The billion dollars goes to the person who successfully fills out a perfect bracket. Now, before you get super excited by the well orchestrated campaign designed to entice you to throw your ball in the court for this opportunity let me slap some logic into you. The chance of randomly predicting the outcome of the NCAA tournaments 63 games is one in 9,223,372,036,854,775,808. That’s 1 in 9 quintillion and then some! There will be a lot of losers. And…a lot of leads! Have you looked at the entry form? The bracket challenge is limited to 15 million people. That’s 15M leads! By doing some quick research I’ve found several websites that sell mortgage leads. 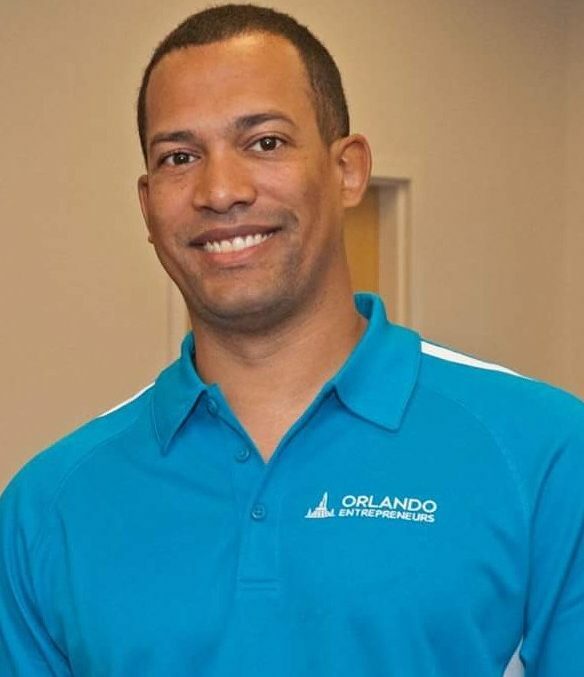 eLeadz.com sells their new mortgage leads for $15/lead, but we all know they are far more valuable to an actual loan originator like Quicken. They can also use this massive lead list to market other related products and monetize even further through sending affiliate offers that they will receive commission on. At a value of $15/lead if Quicken was to purchase these leads from eLeadz they would need to pay $225,000,000. I must admit that I was enticed to sign up for the billion dollar bracket challenge when I saw the commercial on TV. I searched and went to the landing page and upon reviewing the form immediately changed my mind. With a 1 in 9 quintillion chance to win the bracket challenge I can’t justify releasing that much of my personal information. Let’s take a look at other things that are more likely to happen than winning the bracket challenge…. Sources: NBC and Daily Beast. So according to the lightening odds published by NBC, gathered from the National Safety Council, you’re more likely to be hit by lightening 68 billion times before you win the Bracket Challenge. I’ll still likely fill out a NCAA tournament bracket, but will not be participating in the Billion dollar challenge. I’m sure I’ll be kicking myself if I get a perfect bracket!!! Many of the entrepreneurs I know, including myself, are guilty at times of working too much in their business instead of on it. The day to day operations sometimes drive us to do what is urgent versus what is truly important. As an entrepreneur it is very important to dedicate time to focus on the big picture. You have to not only have a vision for how your venture will work in the world of today, but also understand and position your venture so it can thrive in the world of tomorrow. By not keeping up with trends you are putting your venture at risk of getting wiped out by a disruptive innovation. If you are paying attention to trends…you could come up with the next disruptive innovation! The presentation not only provides a large amount of intriguing stats, but also outlines a variety of significant emerging trends. When change, or movement, occurs there are opportunities for those who are prepared and threats for those who are not. I plan on being prepared…how about you? I hope you enjoy this presentation as much as I did. As a movement gains traction and momentum it often compounds. It all starts with a leader (innovator)…someone willing to take a chance at the risk of looking ridiculous. The first visible follower is an integral part of the success of a movement…as is the second follower. These early adopters show people how to follow, but more importantly validate to others (early majority) that the movement is socially acceptable. After the early majority has joined the movement it makes it very easy for the late majority to follow. Often times those who were hesitant to join a movement due to the fear of being ridiculed ironically join the movement for the same purpose…they don’t want to standout and be the only ones not on board with it. Social proof is a powerful force that can work for you or against you. Recently a colleague shared a video with me that illustrates this concept very well. It’s well worth watching!